The Way Home is 25! 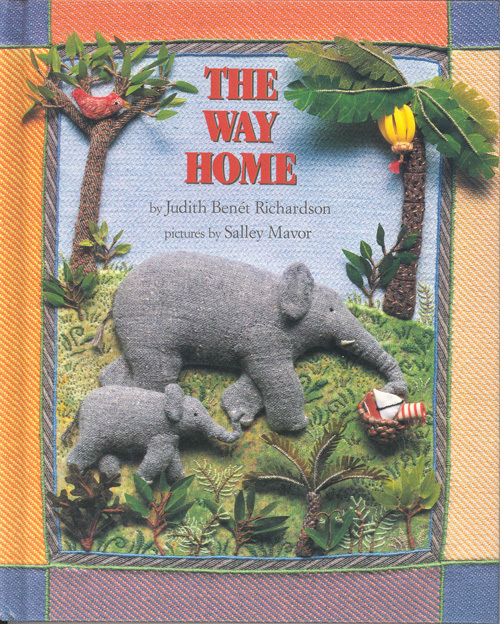 25 years ago this spring, Judy Richardson and I released our first book, The Way Home. Just last week, I saw Judy and we marveled at how young we were in a 1991 publicity photo with an elephant (see below)! Having this book published was quite an exercise in perseverance and I thank Judy for not only writing such a great story, but her unwavering belief that we were a team! In 2010, while recuperating from a broken my wrist, I put my energy into reflecting on the past and sorting through photos. As you can imagine, not being able to manipulate a needle and thread for 4 months was torturous. This predicament forced me to dive into my blog, where I could type stories and use the computer mouse with one hand. I decided to tell the 8 year saga of this first adventure in publishing, from inception to completion, which turned into an in-depth series of posts about The Way Home. Those of you who’ve been following my blog from the start will be familiar with the series, but I think newer subscribers will enjoy the story too! Links are here: Part 1, Part 2, Part 3, Part 4, Part 5. What serendipity! I read your blog this morning and learned that in 2010 you broke your wrist. In late January I did the same thing, and required surgery. And it was my right (dominant) wrist. So I was unable to do all the normal things I enjoy doing while recuperating, handwork being the number one pastime. I have been in physical therapy for 6 weeks and am slowly but steadily regaining the function of my fingers and hand. I loved the lemonade from lemons story of how you used the time for a positive endeavor. I am inspired by your tenacity. This injury was life changing for me. My biggest fear was that I’d never again be able to sew, or garden, or make bread, or draw/write/sketch, etc. Thank you! Oh my, this brings back memories of the long hard struggle to get back my wrist rotation. Hang in there, because you will be able to do all those things you love again! You consistently amaze me with your talent and ability in fabric relief, collage, embroidery and story telling. Your dedication to your art is unsurpassed and every time I read your blog I become inspired. I hope one day our paths may cross and I also hope one day you will offer workshops for those of us who are in awe of your vision. Thank you so much for your kind words, Jennifer. It’s encouraging to know that there are people like you out there! Another book to add to my wish list. Congratulations young lady. Great! I hope that you can get a used copy. Me gusta mucho tu forma de contar historias con hilo y aguja. Te admiro mucho y tus trabajos son muy inspiradores para mí¡¡¡Gracias!! Hi Sally! We lived in Falmouth from 1986-2002. We loved The Way Home and own the book and even bought one of its illustrations at an art sale in Woods Hole! We love your soft sculpture illustrations and the one we bought lives today on the wall of our den here in San Diego. Keep up the wonderful creativity! It’s so nice to hear from you Teresa! Yes, I remember when you bought the piece and am glad to hear that it’s safe and sound in San Diego.